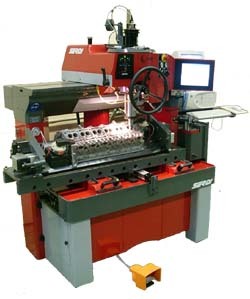 The SERDI 7.0 features a tool changer allowing machining inlet and exhausting valve seats and guides in one working cycle as well as a specific fixture for clamping the cylinder head. This machine relieves completely the operator and makes it possible to use him in other tasks, i.e. preparation of cylinder heads or control of the pieces already machined. This contributes strongly to the fast payback of the machine. The SERDI 7.0 offers you the possibility to ream valve guides, to machine valve seats and valve seat bores, both in manual and automatic mode. Ideal for machining small and medium sized series of cylinder heads.